Two years ago, I read about a party that Lara Shriftman & Elizabeth Harrison created for Barbie (which happens to be one of my company’s clients). The party was for some really cool chick’s birthday – no, I don’t really know her, but this party idea was totally kick a$$. The theme was Barbie & Ken. The invitations were basic, but inside, each guest was given a list of existing Barbie or Ken dolls to use as their inspiration for their attire. Included were Glitter Barbie, Malibu Barbie or Ken, GI Joe Ken, Tennis Barbie, etc. If I was hosting this party with no budget, I would totally send each guest a different Barbie doll that they had to dress like. 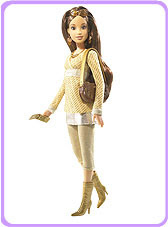 Not to go off subject, but one time I was shopping in the Big Lots in Morgantown, W.Va., in college and low and behold in the toy aisle was a fake Barbie named…BRANDI. I was so p*ssed off. The venue was draped in pink to imitate Barbie’s Dream House. Pink M&M’s, lollipops and candy lipstick were spread around the room. Because this party was obvisiouly posh, the servers were all dressed like Malibu Barbie’s with blonde wigs. I love a good theme party and I love this theme. I feel that when you have a theme party, people don’t participate because they often don’t feel like being creative. By sending their exact attire, you are giving some direction and there is more of a chance people will play along.